This is a tax ID number for non-Spanish citizens. It connects them to the Spanish government and is required to do several things in Spain: hire internet service, utilities, buy property, accept a job, etc. This allows a citizen of a Non-European Union country to live in Spain legally. Some also allow them to work. Citizens of an EU country already have these rights and do not need an Immigrant Visa. It’s For: A citizen of a European Union (EU) country, Switzerland or Norway who qualifies as a Spanish ‘resident‘ (for a definition see the FAQ below). They must apply for a ‘Certificate of Residence’ and on the certificate is the NIE. Process. Apply at the police station in the Spanish municipality where you live. The processing time depends on the station, in Barcelona about three weeks. It’s For: Citizens of the EU who don’t qualify as a Spanish ‘resident’ and all non-EU citizens. It’s a piece of paper with the NIE written on it. It only allows you to do certain acts in Spain, such as hire utilities or buy property. It does not allow you to live or work in Spain. To do this you must go through the immigration process. Process. Apply at any authorized police station or a Spanish embassy. The processing time varies, in Barcelona about three weeks. It’s a long list because you will be living in Spain. 3) Your Resident, or Empadronamiento, Certificate issued by your city government. 4) A Health Insurance Policy. If you have a work contract you’re already enrolled in Spain’s health system and won’t need this. 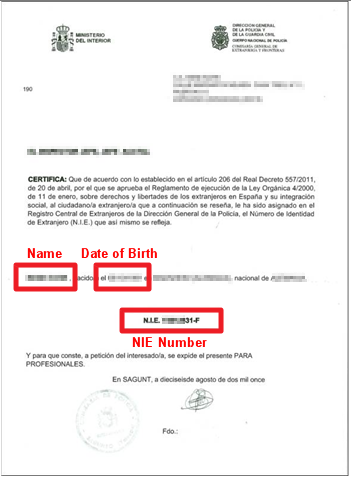 3) A letter issued by a Spanish Notary Public explaining the reason you want a NIE. Citizens of a Non-EU country must have an Immigrant Visa, called a Residence Permit, to live or work in Spain legally. Citizens of some countries, such as the USA, may reside in Spain for 90 days without a visa, but for any time beyond that a Visa is required. We assist with two types. It’s for people who purchase Spanish property, stock or national bonds. It allows you to work and there is no residency requirement. This means you don’t have to live or file an income tax return in Spain. 3) Purchase 2,000,000€ worth of Spanish national bonds (public debt). In Spanish it’s called ‘Visa no Lucrativa’. It’s for people who can show they have a certain amount of monthly income, or savings, to live in Spain. It does not allow you to work. 2) Savings. The average balance in your bank account(s) for the year preceding your visa application equals from app 35,000€ to 77,000€. The exact amount depends on several factors including the Embassy where you apply. We recommend at least 77,000€. The account(s) must be in your name only and you can withdraw the money at will. The amount increases if there are dependents on your visa application. The visa is valid for one year and is renewable. Normally you apply at the Spanish Embassy in your resident country. Your spouse, and children under 18 years old, may be included on your application. Below are some of the required documents. The following are always required. There may be more depending on the Embassy and your country of origin and residence. I'm not a citizen of an EU country and I want to live and work legally in Spain. Do I just need a NIE? No. A NIE does not allow you to live or work in Spain. It’s only gives you a tax ID number so you can do certain things in Spain, such as hire utilities or buy property. To live and work in Spain legally, non-EU citizens must go through the immigration process and obtain an immigrant visa. I'm a citizen of an EU country and I want to live and work legally in Spain. Do I need an immigrant visa? Do I need a NIE? You do not need an immigrant visa but you need a NIE. Immigrant Visa. Citizens of an EU country already have the right to work and live in Spain legally. They do not need to go through the immigration process and obtain a visa. NIE. This is a Spanish tax ID number and is needed to do almost anything in Spain (accept a job, rent a flat, hire utilities, etc). If you don’t want to live in Spain, you can apply for a non-resident NIE. What is a 'resident' of Spain? 1) You spend more than 183 days or more in Spain in one calendar year. The days do not have to be consecutive, it’s the total. 2) You spend less than 183 days per year in Spain, but your spouse lives in Spain and you’re not legally separated. 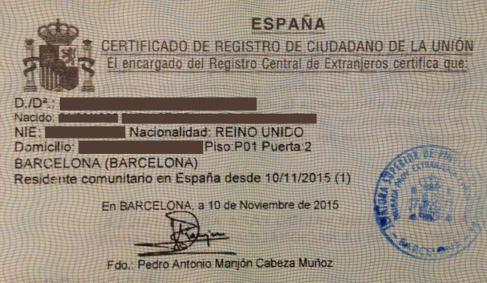 Note: If you can prove you’re a tax resident of another country, it might exempt you from being a resident of Spain. Each case must be analyzed separately. 3) Your “center of vital interests” is in Spain. This means your economic or professional activities are based in Spain and it’s where you earn substantial income. You are then a tax resident and have to pay taxes in Spain. If you are a resident of Spain, you must apply for a Certificate of Residence. This gives you a taxpayer ID number called a NIE. You use this number to file your taxes in Spain. What does it mean to be a 'tax resident' of Spain? A tax resident of Spain is someone who qualifies as a Spanish ‘resident’ as described in the questions above. As a Spanish resident you must report your annual world-wide income in Spain and, if necessary, pay taxes on it. There are exceptions. Contact us for advice. We can obtain a NIE for you in Barcelona fast and cheap. For taxes, we work with a Spanish tax attorney who specializes on tax issues for non-Spaniards. These issues can be tricky. A good tax attorney is very important. Feel free to call or email for some advice. Thanks again for visiting our site.